The rise of Islam was accompanied by a major expansion in manufacturing and trade. Thousands of jars such as this one were produced for storing and transporting goods, like date honey. They were essentially functional objects, and it was almost certainly the content of the jars, rather than the jars themselves, that was valued in this trade. This example is particularly impressive because of its size and aesthetic appeal. Being 77 cm tall, it would have been thrown in two sections and joined in the middle. It was made in Iraq in the 8th to 9th century. 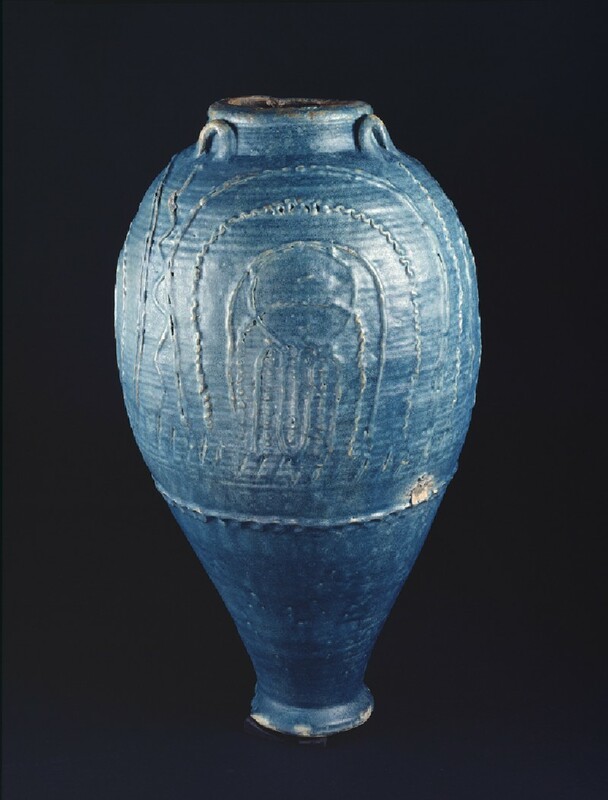 This kind of glazed ware predates Islam, and illustrates the simple, functional foundation upon which more inventive and creative glazing techniques were developed across the Islamic world. Fragments of this type of jar have been found around the Persian Gulf, down the East African coast, around the coast of India and South-East Asia, and as far as China and Japan. Only a few dozen have survived intact. Purchased with the assistance of the Miller Bequest, 2005.